Lots of Ozzie Newsome plaudits going around, and justifiably so. Since he is widely considered the best personnel man in the league, I thought it’d be fun to compare his drafts side-by-side with Andy Reid’s over his tenure with the Eagles. 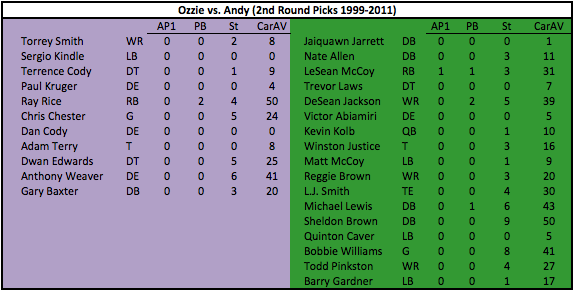 Here is a breakdown of Ravens and Eagles draft choices since 1999. Let’s start with the big one, the first round. AP1 means All-Pro, PB means Pro Bowl, and St means seasons as a starter. We covered CarAV before (its the pro-football-reference measure of production). Please note that CarAv is not calculated for K/P, that’s why they each have a zero. Looking over all of it, the big difference is in this round, which readers of this blog will realize is by far the most important. Outside of McNabb, Reid just wasn’t able to produce impact players like Ngata, Suggs, Lewis, McAlister. It isn’t enough to get decent players like Patterson in the 1st round. Additionally, the aforementioned Ravens overshadow Newsome’s big mistakes with Boller, Clayton, Taylor. Contrast that to the 2nd round. Suddenly Ozzie doesn’t look like a genius. In fact, it’s a pretty clear advantage to the Eagles (not to say the Eagles haven’t missed a bunch of these picks.) However, as we’ve seen, the 1st round is significantly more important than the rest of the draft combined. So mistakes in the 2nd round aren’t nearly as punitive. The third round tilts in the Eagles favor, especially since B-West was drafted here. Meanwhile,the Ravens’ 3rd round history is relatively undistinguished. Lots of misses in the 4th round for the Eagles, though they had more draft choices than the Ravens. Notice this is where the Ravens grabbed players who could contribute significantly at relatively unimportant positions (FB, P, interior OL). Production-wise it’s fairly close. 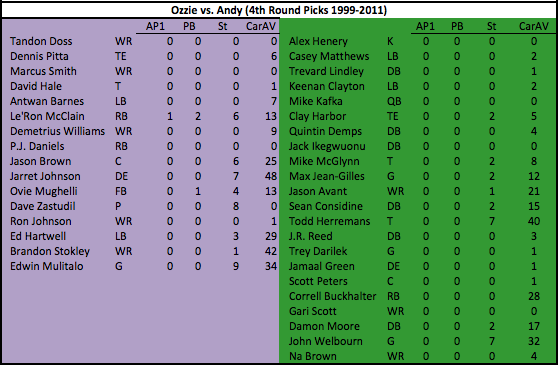 The 5th round has to go to the Eagles since Trent Cole is by far the best selection from either team. 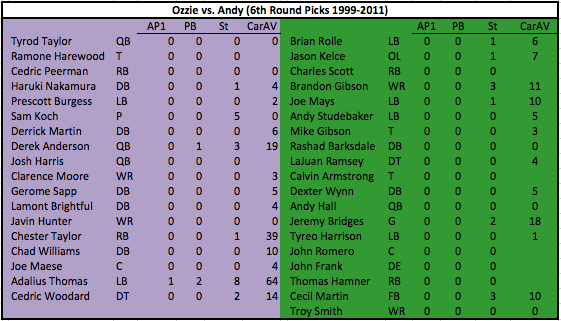 This 6th round is a relative wasteland for the Eagles, though there’s hope Kelce will change that. Meanwhile the Ravens hit on Thomas and Taylor. Note: that is not a typo, Derek Anderson really did make a Pro Bowl. Script gets flipped for the 7th round, as the Ravens haven’t found anyone useful. The Eagles have done a pretty good job in the 7th, though that can also be attributed to the weakness of the team allowing players like Chaney and Coleman to become starters. 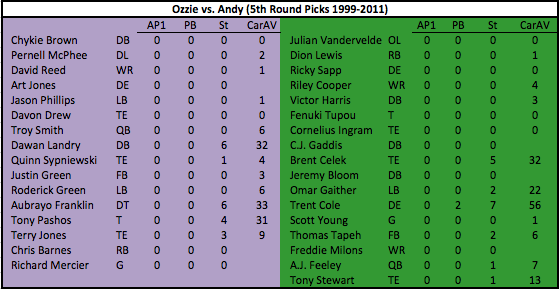 As you can see, when it comes to drafting it’s a fine line between genius (Ozzie) and fired (Andy), but it depends largely on success in the 1st round. 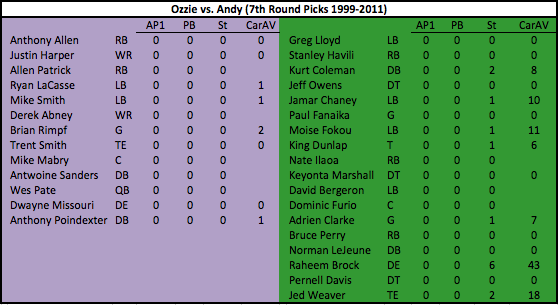 The only real standout for Ozzie in the later rounds is Adalius Thomas. Newsome has had a lot of success with UFAs, but in terms of the actual draft, he’s built his reputation on the performance of his first round picks, not late-round steals.